A huge, impressive stainless steel cooker with a touch keypad and electronic display. Machine is programmable and prepares every type of rice perfectly—from sushi-style to porridge (www.zojirushi.com). No frills, with a clear glass lid and an easy-to-clean nonstick bowl that fits snugly inside the machine. Rice cooks with no brown spots. Comes with a steamer basket to cook vegetables over the rice (www.panasonic.com). Good value. 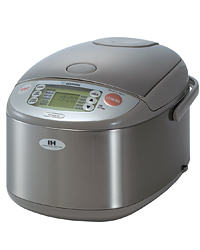 A compact minimalist machine (the settings are simply “cook” and “warm”) that prepared rice the quickest (two cups of rice in 30 minutes) of those tested. The bowl and lid are dishwasher-safe (www.proctorsilex.com). Also works as a steamer and a slow cooker. Makes good rice, with only a slight crust on the bottom. The lid is connected to the body of the machine, which makes it harder to clean than detachable ones (www.krupsonlinestore.com).